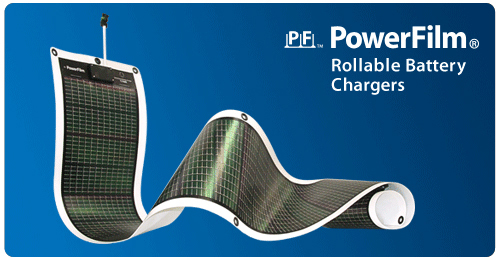 The Rollable Series Flexible Solar Cells were built with the outdoors in mind. Each unit is assembled using high grade marine components, sealed edges for waterproofing, and built in grommets for easy fastening. These rugged characteristics make this series perfect for hiking, backpacking, tenting, and all marine activities. With three sizes to choose from, the Rollable Series Cells will provide reliable power for all your charging needs in the most remote of places. To store the cells, simply roll them up and toss in your bag. Each unit comes with a 15ft. extension cord with o-ring attachments for easy charging of 12V batteries. Should you need to charge batteries for you mobile electronics, we also offer a full line of authorized accessories to accommodate your specific needs. Yes, engineering fees vary according to the requirements of the job. Changes in encapsulants or widths are typically lower than requests for nonstandard power specifications and/or physical sizes. Our compact 7 watt flexible solar panel is perfect for keeping small electronics charged while camping, fishing or hiking.